François Quesnay (June 4, 1694 – December 16, 1774) was a French economist, founder of the Physiocratic school. He also practiced surgery, serving as surgeon to King Louis XV and his mistress, Madame de Pompadour. Quesnay, in opposition to the then-dominant mercantilist position, advocated a laissez-faire policy against government interference with trade. As an attempt to support this position, Quesnay developed his famous Tableau Economique, which purportedly showed that the only productive sector was agriculture, and that industry was "sterile," i.e. unable to produce a surplus of output above costs. While Quesnay's model had many limitations, he recognized that his idealized "natural" system did not reflect reality, and thus he argued that the government should lift restrictions allowing the natural economic order to emerge. Quesnay envisioned this natural economic state as a balanced, circular flow of funds—a system he saw as similar to the flow of blood in the body, achieving an equilibrium which maximizes the net product, and therefore the health of the society, similar to homeostasis in living organisms. This may be his most enduring insight. François Quesnay was born on June 4, 1694, near Paris France, into a humble family. His father worked as a ploughman and merchant. In 1711, Quesnay entered into training for five years as a Parisian engraver. Following this, he registered at the university in the college of surgery, receiving his degree in 1717. In 1718, Quesnay was accepted into the community of surgeons of Paris. In 1723, he became royal surgeon, entering in the service of the Duke of Villeroy in 1734, and in 1744, was awarded the rank of doctor of medicine. Five years later he became physician to Madame de Pompadour, influential mistress of King Louis XV. Elected to the Academy of Science in 1751, Quesnay became a member of Royal Society in 1752, and the same year he was made a noble by the king. François Quesnay's interest in economics arose in 1756, when, hoping to draw on his country background, he was asked to contribute several articles on farming to the Encyclopédie of Denis Diderot and Jean Le Rond d'Alembert. Quesnay delved into the works of the Maréchal de Vauban, Pierre de Boisguilbert, and Richard Cantillon. Mixing all these ingredients together, he came up with his famous economic theory. 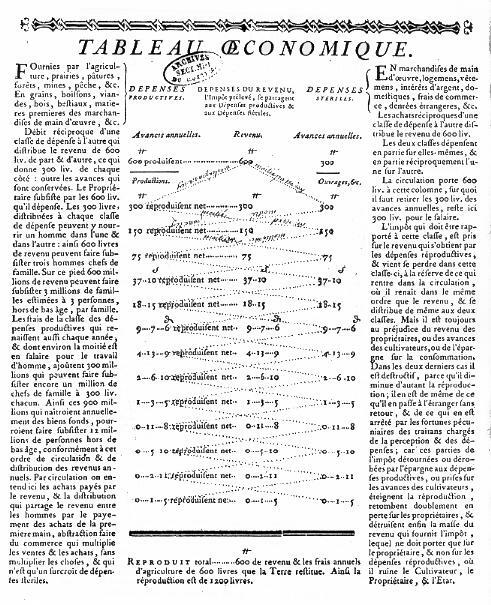 In 1758, Quesnay wrote his Tableau Économique—renowned for its "zigzag" depiction of income flows between economic sectors—to explain his doctrine. This became the founding document of the Physiocrats and the ancestor of the multisectoral input-output systems of Wassily Leontief. While the accepted founder of the classical school of economics was Adam Smith, he acknowledged his indebtedness to the French Physiocrats, and so in turn to their founder, François Quesnay. Quesnay died on December 16, 1774, in Versailles, France. François Quesnay began with the axiom that agriculture is the only source of produit net (net product, or surplus of output above cost). The wealth of a nation, Quesnay argued, lies in the size of its net product. He believed that manufacturing and commerce were "sterile" as (in his view) the value of their output was equal to the value of their inputs. Only land, Quesnay reasoned, produced more than went into it. He claimed that the only "productive" person is the farmer, the only one that generated a net product. The landlord, the farmhand, the foreign merchant, and, most notably, the artisan, were all part of the "sterile class" because none of them generated a net product. In this, Quesnay opposed the mercantilist doctrines of Colbert, believing that they concentrated too much on propping up industry and commerce rather than supporting agriculture. Quesnay's system of political economy was summed up in Tableau économique (1758), which diagrammed the relationship between the different economic sectors and the flow of payments between them. In his Tableau, Quesnay developed the notion of economic equilibrium, a concept frequently used as a point of departure for subsequent economic analyses. He conceived of the natural state of the economy as the balanced circular flow of income between economic sectors, and thus social classes, maximizing the net product. In these concepts, Quesnay saw analogies to the circulation of human blood and the homeostasis of a body. The term laissez-faire, laissez-passer—“let it be, let it pass” (although the phrase is not readily translatable), was widely used by the Physiocrats in urging freedom from government interference, and was later adopted by Adam Smith. Quesnay believed, in opposition to the then-dominant French mercantilists, that high taxes and high barriers to imported goods were the cause of French poverty. Thus, he wanted Louis XV to deregulate trade and cut taxes so that France could begin to emulate wealthier Britain. Influenced by Vincent de Gournay, an advocate of laissez-faire, Quesnay wished to see many of the Medieval rules governing agricultural production lifted, permitting the economy to find its "natural state." Thus, François Quesnay was largely responsible for the distinction between the ordre naturel (nature's order) and the ordre positif (positive, i.e. human-idealized, order). A good government, Quesnay argued, should follow a laissez-faire policy so that the ordre naturel could emerge. The methodology of Quesnay's physiocratic system and his principles of policy sprang from an extreme form of the doctrine of natural law, which he believed represented the divinely appointed economic order. He was, therefore, one of the originators of the nineteenth-century doctrine of the harmony of class interests, and of the related doctrine that maximum social satisfaction occurs under free competition. Farmer: produces grain, owns livestock and seed, hires labor, pays rent to landlord. Artisan: produces crafts, uses local grains and foreign goods as raw materials. Farmhand: works for farmer, receives wages. Merchant: sells foreign goods he has imported and buys local grain for export. Landlord: owns land, receives rent from farmer. A view of Quesnay's original Tableau Economique shows a zigzag flow. The left side of the Tableau represents the "productive" class (farmer) and the right side represents the "sterile" class (artisan). At the top in the center is the landlord. The landlord begins the flow by buying goods from both the farmer and the artisan; hence the income flows from the landlord to both the left (productive) and right (sterile) columns. Quesnay claimed that the most "productive" sector is agriculture, the only one that can generate a net product. He was well aware, though, that he created an idealized "natural" system and he repeatedly noted that "real" conditions are never as smooth as the example in the Tableau. He wanted to bring to the King's attention the real market distortions: inequitable taxation, insufficient compensation due to excessive taxes, underdeveloped markets, protectionist trade distortions, etc., which the government could help to mitigate. In other words, he said that under the present conditions only the agricultural sector could produce a surplus that could then be used to produce more the next year and, therefore, help growth. Industry and manufacturing were, under those existing circumstances (that he wanted to change), sterile. avances foncières (fundamental/landed advances): one-time capital expenditures undertaken by landlords on their land, e.g. land-clearing, drainage, fence-building, etc. avances souveraines (sovereign advances): one-time capital expenditures undertaken by government, e.g. roads, bridges, etc. avances primitives (primitive advances): expenditures on durable producers' goods, e.g. horses, cattle, plows, etc. In the Tableau, these are also referred to as avances originelles (original advances). avances annuelles (annual advances): expenditures on the wages of labor and non-durable producers' goods, e.g. cattle-feed, seed, etc. Of these categories of advances, types (three) (original) and (four) (annual) are the most important and the ones which Quesnay analyzed most deeply. His distinction between original advances and annual advances was imported by Adam Smith as "fixed" and "circulating" capital respectively. This simplified form of the Tableau illustrates the zigzag flow of funds. Down on the right side of the Tableau is the productive class (Farmer) and on the upper left side there is the Artisan. On the lower left side is the Landlord. For the sake of simplicity, we have two production processes—grain and crafts—and both of them use previously accumulated stocks of grain as raw materials. Only the Farmer and the Artisan produce. Some of their products they retain internally, the rest they supply to market. What is supplied to market is exchanged for cash; what is retained internally does not command cash. At the market, their goods are bought by different people. Simplified version of part of Quesnay's Tableau Économique. In the following account, we trace the movement of grains and crafts. Note that that the numbers are not payments, but merely quantities reflecting the output flows. Notes: In the agricultural sector the Farmer has to use part of his output to feed his livestock, a new category. Also the Merchant does not buy any of the Artisan's goods, but only the Farmer's grain. The Laborer is to receive 150 of the Farmer's output. This is only part of his wage (paid in kind). Another part will be paid in cash (using annual advances denoted in items (three) and (four) above). The 300 units of grain going to the Landlord are not rent payments—the Landlord just happens to buy the Farmer's grain at the market place. The Landlord's initial expenditure is in fact equal to his total rent income of 600. So, rent "initiates" the process. As the zigzag diagram shows, from his 600 rent income, the landlord spends 300 on agricultural products and 300 on manufactured products. The total net product of the economy is identical (in this oversimplified example) to the Landlord’s “initial” expenditure from rent. Thus, the “rent on land” and the “net product” created are the same (Quesnay 1758, 1759). Although Quesnay was wrong about the sterility of the manufacturing sector, he was right in ascribing France's poverty to mercantilism, which he called Colbertisme (after Louis XV's finance minister, Colbert). The French government had protected French manufacturers from foreign competition, thus raising the cost of machinery for farmers, and had also sold to wealthy citizens the power to tax farmers. In Quesnay's Tableau Économique we see perhaps the first attempt to describe the workings of the economy in an analytical way, and as such this can be viewed as one of the first important contributions to economic thought. Also, it was the ancestor of the multisectoral input-output systems of Wassily Leontief. While the accepted founder of the classical school of economics is Adam Smith, he, in turn, acknowledged his indebtedness to the French Physiocrats, the pioneer school of economic thought which advocated a single land tax and free trade. And the founder of the Physiocratic movement was François Quesnay, the King’s physician. Quesnay, F. 1756-1757. "Évidence," "Fermiers," and "Grains" in Encyclopèdie of Diderot and d'Alembert. Quesnay, F. 1758. "Questions intéréssantes sur la population, l'agriculture et le commerce" with de Marivelt in Mirabeau, l'Ami des Hommes. Pt.IV. Quesnay, F. 1759. Essai sur l'administration des terres. Quesnay, F. 1768. La physiocratie. 2 vols. Quesnay, F. 1888. Oeuvres économiques et philosophiques. Sientia Verlag, Aalen. This page was last modified on 21 July 2016, at 16:38.